Hello from Cancun and COP 16! 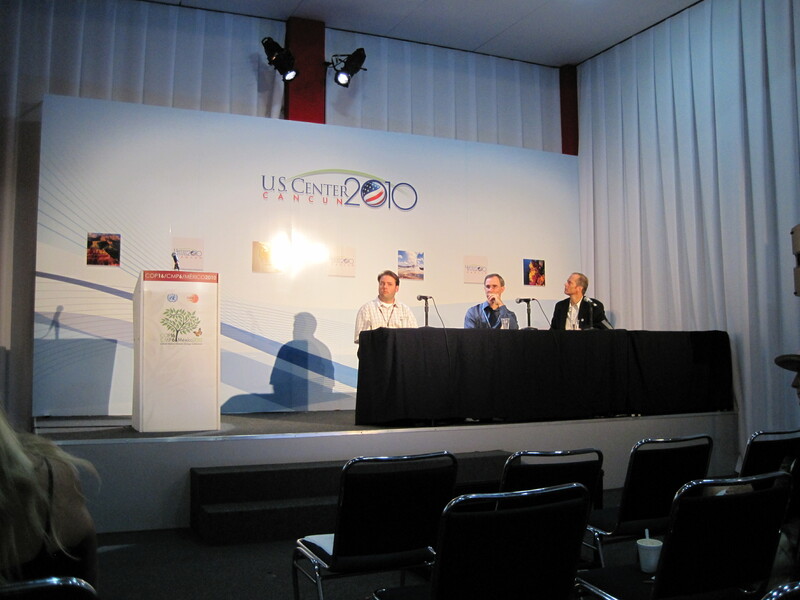 This afternoon the U.S. Center sponsored a talk titled “Tropical Cyclones and Climate Change”. The speakers included Tom Knutson (NOAA), Scott Braun (NASA) and William Putman (NASA). The discussion focused on improving our understanding of how future tropical cyclones may change due to global warming. Dr. Knutson presented the findings of a recent expert assessment on the impact of climate change on tropical cyclones by the World Meteorological Organization. The assessment is titled “Tropical Cyclones and Climate Change” and was published in Nature Geoscience earlier this year. The assessment states that “it remains uncertain whether past changes in tropical cyclone activity have exceeded the variability expected from natural causes.” Despite this claim, the assessment and Dr. Knutson state that future climate projections, using climate and atmospheric models, show that global warming will cause an increase in the average global intensity of tropical cyclones of 2-11% by 2100. In addition, model studies predict a global decrease in the average frequency of tropical cyclones by 6-34%. 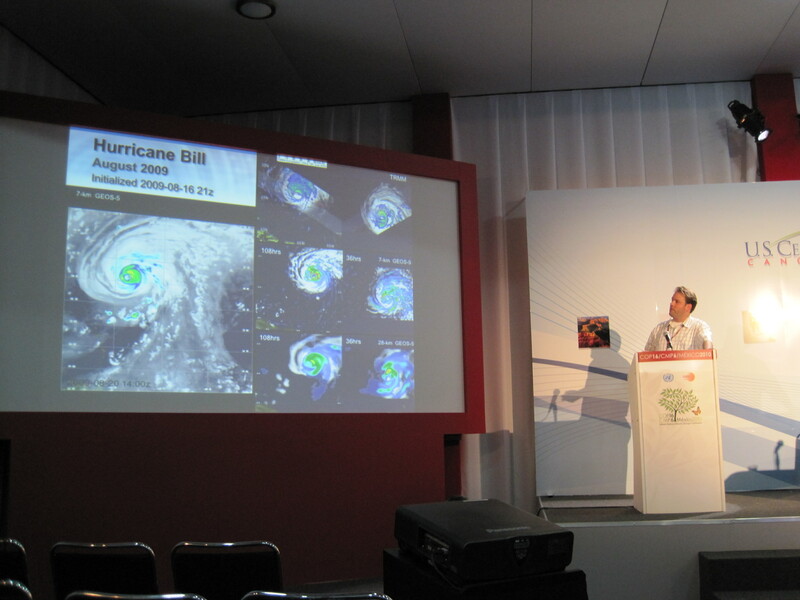 Dr. Putman discussed advances being made in the models that are used for tropical cyclone forecasting and modeling. The use of climate models for the simulation of hurricanes provided many challenges. Dr. Putnam states that one such challenge is the high horizontal resolutions needed to simulate tropical cyclones in climate models. Such high resolutions result in very computationally expensive simulations. In addition, satellite observations are being used to compare and validate model simulations in order to improve the forecasting ability. Dr. Braun talked about applying technology to better monitor and predict hurricanes. There are numerous aspects of tropical cyclones that are still not well understood. This includes how hurricanes form and the role of rapid intensification (why do some storms develop into major hurricanes while some only develop into weak tropical storms?). Scientists are also interested in the role that large-scale environmental processes play in hurricane development, when compared to in-storm processes. Dr. Braun discussed how technologies, such as NASA satellites and aircraft, are helping to shed light on these uncertainties in hurricane science and forecasting. Hurricanes account for catastrophic damage and loss of life throughout the world. It is becoming more apparent that tropical cyclones/hurricanes are going to change in some manner in the coming century as a result of global warming. Climate models–the same models used for climate studies in the Intergovernmental Panel on Climate Change reports–are now starting to be used to predict the impact of climate change on tropical cyclones. However, we have a long way to go. Climate models are continually improving with advances in accuracy and efficiency. It is expected that these improvements will allow future assessments to provide more certainty into how tropical cyclones will change in future.